Panasonic has announced that its revolutionary Micro Four Thirds sensor has broken free of its camera confines and is to be included in its upcoming AG-A4100 camcorder. The professional cam is the first to house the Micro Four Thirds format, something that Panasonic claims will: "deliver the shallow depth of field and wider field of view of a large imager, with the flexibility and cost advantages of use with a growing line of professional quality, industry standard micro 4/3-inch lenses, filters, and adapters." This is big news for Panasonic – which it has built in collaboration with Olympus – as it widens the reach of Micro Four Thirds into the lucrative sector of movie making. The camcorder does have an interchangeable lens system, so both film lenses and stills camera lenses should work with it and its native 1080/24p footage will be recorded on to either SDHC or SDXC cards. To make sure you aren't constantly changing cards, there are two slots included on the chassis. As Panasonic is pitching the camcorder at pros, there is the choice between 60Hz and 50Hz shooting (depending on which broadcast standard you are filming for) and there's also a choice of frame rates. Other features include a built-in ND filter, time code recording, USB 2.0 and mic ports and two-channel digital audio recording. 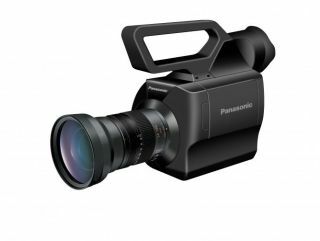 The Panasonic AG-AF100 has no confirmed UK release date, but will be out at the tail-end of 2010. Pricing is also TBA, but it looks likely to be in the region of $6,000.